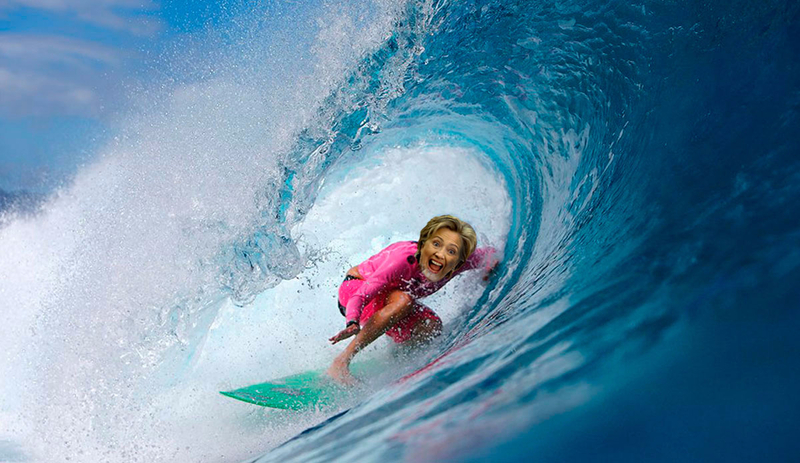 Hillary getting pitted at the Keystone Pipeline. If you’re breathing and you’re registered to vote in California or New Jersey (or North Dakota, South Dakota, Montana, or New Mexico for that matter) today’s your day–finally. Exercising your civic duty in these states during primary season can be frustrating. As the last territories to vote before the general election in November, besides Washington, D.C., often there are clear “presumptive nominees” for both parties by this time. Such is the case with Donald Trump. He clinched the nomination with the necessary number of delegates in May, and his competitors publicly conceded. And yesterday the Associated Press reported Hillary Clinton’s nomination for the Democratic ticket was a certitude. But Bernie Sanders has yet to concede, which means today still matters–even if Bernie is a long shot for the nomination. So, being that Trump has moved on to the next round, where do the two remaining candidates stand on the issue that most impacts surfers daily lives: the environment? Turns out they’re not so different. Both candidates have recognized the detrimental impacts of climate change, and have developed plans to address its root causes. Make the United States the leader in clean energy of the 21st century. Install 500 million solar panels, and generate enough renewable energy to power every home in America. Reduce energy use in homes, schools, and hospitals by a third. Reduce oil consumption by a third. Reduce greenhouse gas emissions to 30 percent below 2005 levels in the next decade. Reduce U.S. carbon pollution by 40 percent by 2030 and by 80 percent by 2050. Create a 100% clean energy system, resulting in a Clean-Energy Workforce of 10 million jobs. Return billions to consumers impacted by the transformation of the energy system, protecting the most vulnerable communities in the country. One of the biggest areas where both differ is on fracking–the controversial method of extracting oil and natural gas from sediment called shale. Bernie hopes to ban the practice completely. Hillary has said that heavy regulation under her administration would lead to a de facto ban. However, as secretary of state, she supported sharing American fracking technology overseas, and has called the practice a preferable alternative to coal. The two also disagree on nuclear energy. Hillary views nuclear as a key component of a transition to renewables, whereas Bernie hopes to eliminate nuclear altogether. From an environmental perspective, it’s a toss up. Bernie’s plan is clearly more ambitious, but runs the risk of promising too much with little regard for the practicality of pushing initiatives through Congress. On the other hand Hillary’s goals are only slightly less ambitious. Regardless of their policies, though, who you vote for today does matter – at least for Democrats. Bernie’s chances of clinching the nomination are minute, even with landslides in California and the five other contests taking place today. But if Bernie were to have such luck, it would send shockwaves through the Hillary campaign, forcing them to make serious adjustments. If Hillary went on to officially win the nomination, she’d have no choice but to adopt stronger rhetoric on the environment. Alternatively, if Hillary were to undisputedly win today, it’d serve as a confirmation of her current position on climate change and the environment, among others. The point is current discourse may tell you that your vote doesn’t matter today. And the reality is, statistically speaking, today’s outcome has little chance of impacting a Hillary vs. Trump general election. But what today’s results will decide is discourse. It can shape the debate–either in favor of Hillary or in favor of Bernie. So get out there and vote!